Karim Khan, Anti-Drone Activist Who Lost Family Members to U.S. Strike, Goes Missing in Pakistan | Democracy Now! freelance journalist and director of the documentary Wounds of Waziristan. Her work has appeared in Foreign Affairs, Vice, the BBC, PRI’s The World, Global Post and other outlets. She is co-editor of the anthology Dispatches from Pakistan. NERMEEN SHAIKH: We begin today’s show in Pakistan, where an anti-drone activist and journalist has gone missing just days before he was due to travel to Europe to speak with Parliament members about the impact of the U.S. drone wars. The legal charity Reprieve says Karim Khan was seized in the early hours of February 5th by up to 20 men, some wearing police uniforms. He has not been seen since. Karim Khan’s brother and son were both killed in a drone strike. He told his story in the recent documentary Wounds of Waziristan. AMY GOODMAN: Karim Khan speaking in the film Wounds of Waziristan. Since his son and brother were killed in 2009, Karim became a prominent anti-drone activist. He’s been missing since last week. The executive director of Reprieve, Clare Algar, said in a statement, quote, “We are very worried about Mr Khan’s safety. He is a crucial witness to the dangers of the CIA’s covert drone programme, and has simply sought justice for the death of his son and brother through peaceful, legal routes,” she said. Well, for more, we’re joined by Madiha Tahir. She made the film Wounds of Waziristan. She is a freelance journalist whose work has appeared in Foreign Affairs, Vice, BBC, PRI’s The World, Global Post and other outlets, co-editor of the anthology Dispatches from Pakistan. Madiha Tahir, thanks so much for being here. We broadcast Wounds of Waziristan and got tremendous response to it. Now one of the key figures who you interview in it, Karim Khan, is gone, at least for the moment. Explain who he is, his significance. MADIHA TAHIR: Karim Khan is actually one of the first people to bring a case in the Pakistani courts on—about drone attacks. So he’s the one who started to bring cases forward, and he has been working with a lawyer, Shahzad Akbar, who has been fighting on behalf of drone survivors and families of the dead. And Karim was working with Shahzad to help, you know, not only in his own case, but also to help and assist in other cases that were being brought forward in Pakistani courts to demand restitution and demand transparency for—you know, for these attacks. NERMEEN SHAIKH: Madiha, can you give us a sense of how many such cases have been filed and whether other anti-drone activists in Pakistan have been targeted in any way or in fact picked up in the way that he was, Karim Khan? MADIHA TAHIR: So, Karim is the first, that I know of, that has been picked up who is an anti-drone activist, but disappearances in Pakistan are very common. It’s a common state tactic. It has been happening in Balochistan, where there is a separatist movement, for a long time now. And, in fact, three are families protesting. There were mass graves found in Balochistan of missing people quite recently, only a few weeks ago. So this is a very common tactic by the state, and now, clearly, the Pakistani establishment, which is to say the intelligence agencies and the Pakistani army, want to send a message to the anti-drone movement to tell us to—you know, to tell the movement to shut up, basically. AMY GOODMAN: I want to go back to your film, Wounds of Waziristan. In this clip, Karim speaks to you, Madiha Tahir. AMY GOODMAN: There again, Karim Khan, who went missing last week. And the people who took him, how many people saw this go down? MADIHA TAHIR: His family was at home. His wife and his children were at home when it happened, so they saw it, and there are other eyewitnesses who saw it. He was picked up by 15 to 20 people. It seems to be people who were dressed in plainclothes, as well as police officers, who picked him up and disappeared him. His whereabouts are unknown. His family has not been able to find out where he’s being kept. Shahzad Akbar, the lawyer, did file something on his behalf in the Lahore court, and the court has ordered the intelligence agencies now to produce him by February 20th before the court. So we have to wait for that date and see what happens. But the best scenario would be that he is released before then. NERMEEN SHAIKH: And Karim Khan moved from Waziristan to Rawalpindi. Can you talk about the significance of the area from which he was picked up and whether it’s significant that—or whether it ’ widely believed that the people who were responsible for picking him up were the ISI, the intelligence services, or the military, or a combination? MADIHA TAHIR: I mean, I think it is significant. It speaks to the nature of—again, it speaks to the nature of state violence in Pakistan. I think the news media both in the United States and in Pakistan has been—and, you know, rightly so—discussing the attacks by militants that have happened in Pakistan, and those acts, you know, have been reprehensible. Just two days ago, there was a bomb blast in a Peshawar cinema that killed anywhere between 11 to 13 people. But it’s important to realize that that violence happens in a context, and that context is state violence, which has been brutal, in the sense of it’s very quiet, there are disappearances like this. In this case, it’s a high-profile activist, but there are many people who we don’t even know have been picked up and disappeared by the state. So it is—you know, there’s a cyclical pattern between state violence and the non-state violence that is happening in Pakistan. AMY GOODMAN: Madiha, talk about what he would say if he did get out. Where was he going in Europe? Who was he going to be addressing? MADIHA TAHIR: Karim Khan was actually slated to speak to several European parliaments next week, and he was going to talk about the drone attack that killed his son and his brother on New Year’s Eve in 2009. And he would have talked about the cost of these attacks on the people in the tribal areas in Pakistan, who are some of the most marginalized communities in Pakistan. For simply for wanting to speak out about what happened to him and what is happening and continues to happen in that area, he has been disappeared by the Pakistani state. And certainly, I think, you know, we shouldn’t forget that the United States has backed and funded the Pakistani military, and this is happening, so, in conjunction with these states working together, both Pakistan and the United States. NERMEEN SHAIKH: Madiha, you also spoke about the increasing cycle of violence in Pakistan, both state violence and anti-state violence. Could you draw the links between what you think is the correlation, or if there is any, between the increasing number of drone strikes and really the unprecedented number of suicide bombs that occur now in Pakistan, a place which never knew suicide bombs 10 years—you know, 10 years ago? MADIHA TAHIR: Yes. I mean, I think it’s—we have to be wary of drawing simple causes. So it’s not that, you know, suicide bombings are happening because. You know, it’s not a straightforward cause; however, there is a linkage. And you’re right, there is a correlation. The suicide attacks have increased in the last decade as Pakistan has been attacked by drones and has participated in the war on terror. The violence in Pakistan has gotten so much worse, not just suicide bombings, but all sorts of blasts happening. So, certainly, the war on terror, if it was meant to protect Pakistanis, is not working at all. It has actually had an adverse effect. By some estimates, you know, anywhere—you know, something like 30,000 Pakistanis have been killed in attacks by non-state actors. So, the war on terror is something that is something that the U.S. and the Pakistani government have been sort of working on together, but it’s certainly not had—it’s certainly not been to the—on behalf of Pakistanis. AMY GOODMAN: Madiha, I want to go back to your film, Wounds of Waziristan, where you speak with Karim Khan’s lawyer, the man you just mentioned, Shahzad Akbar. AMY GOODMAN: In 2012, Democracy Now! spoke to Shahzad Akbar, the co-founder of the Foundation for Fundamental Rights, an organization that represents victims of drone strikes in Pakistani courts. Again, he is Karim Khan’s lawyer. And Akbar explained why he decided to visit the United States at that time. SHAHZAD AKBAR: I, on behalf of the victims in Pakistan, wanted to reach out to Americans so that they can make an informed judgment on drones. Their opinion matter, and it’s going to matter in next elections, as well. So they need to know what drones are doing to humans in Pakistan, many of them who are civilians. And it has been said by independent groups and journalists, as well, a bigger—higher number of civilian victims. And that has to be reported to the American public so they can make an informed judgment on drones, that if American government should let be killing people overseas in their names. AMY GOODMAN: Now, this is Shahzad Akbar, who you’ve just watched and listened to. He was in the United States in 2012. But this past year, when some of his clients came to the United States, drone victims—the Rafiq Rehman family, little girl, little boy, both injured when their grandmother was blown up in a drone strike—he was not granted a visa to come to the United States. The significance of this, Madiha Tahir? Of course, it made it much more difficult. They didn’t speak English. He would have been as much their navigator and their comfort. They were in a strange land, in fact a land where the drone came from that killed their grandmother. MADIHA TAHIR: I mean, these are people that are seeking peaceful, legal routes for restitution for something—for a great harm that has been done to them and for a loss they will suffer for the rest of their lives. And so, to not allow their lawyer is to say that the U.S. doesn’t care about legal—about the rule of law and about the legal process at all, to not allow their representatives to come to the United States and to speak, you know, to stand by his clients and to speak alongside them. I think it’s highly problematic, but I think it speaks to the secretive nature of the American state. NERMEEN SHAIKH: And, Madiha, can you give us a sense of how many victims or families of victims of drone strikes have attempted to bring their cases to the courts, either in Pakistan or indeed in the U.S.? MADIHA TAHIR: I’m not sure exactly what the figures are at this point, because the cases are at different levels. Some of them are still—they’re—Shahzad and others are actually still in the process of gathering information in order to, you know, get the cases out there. 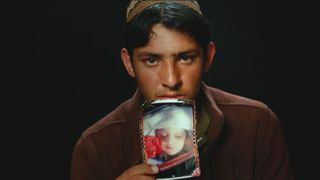 So the most significant cases right now are—you know, there’s been the Karim Khan’s case and also Noor Khan, who is the son of the tribal—the mullah who was killed on March 17th in a drone attack on a jirga, a gathering, that killed upwards of 40, 50 people. AMY GOODMAN: The Obama administration is facing criticism over reports it’s debating whether to kill a U.S. citizen living in Pakistan who’s allegedly plotting terror attacks. On Monday, I spoke with journalist Glenn Greenwald, who recently launched TheIntercept.org with Jimmy Scahill and Laura Poitras. I asked Glenn about the initial Associated Press article that broke the story. And folks can go to our website at democracynow.org to hear what Glenn responded. I think, actually, we have it for you right now. GLENN GREENWALD: The very idea that the U.S. government suspects an American citizen, not of having already engaged in crimes, but of planning to do so, as Jeremy said, it’s like a pre-crime framework, where the U.S. government tries to guess at who will engage in crimes in the future and then treat them as a criminal—but then, not just treat them as a criminal, but declare them guilty in secret proceedings, not involving any court, but by the decree of the president of the United States to literally, A, declare the person guilty, B, impose the death penalty, and then, C, go out and carry out the execution—just like they did with Anwar Awlaki and Samir Khan. And now they are obviously viewing it as a regular practice. I mean, no American, no matter your political affiliation or ideology, should accept the idea that the president of the United States has the power to order American citizens killed, not on a battlefield or anywhere else that is in a war zone, but simply on the suspicion that they intend to engage in future criminal behavior. To describe that power is to describe the most extremist and out-of-control government you can get. AMY GOODMAN: That is Glenn Greenwald of The Intercept. Mahiha? MADIHA TAHIR: Yes, I mean, I agree with Glenn Greenwald. It is—you know, it is a kind of pre-crime for which this American citizen is now going to be possibly attacked for by the United States. I think it’s important to remember that most of the people who are being attacked in exactly a similar way are not Americans, they are Pakistanis, Yemenis, Somali, etc. In Pakistan, as you know, there has been the tactic of what are called signature strikes, which are strikes that aren’t actually targeting a specific, named, high-value target or anything of that nature, but rather people whose behavioral patterns, for one reason or another, appear to trigger a suspicion in the U.S. intelligence apparatus that they may or may not be militants. We don’t actually know. But simply on that basis, on very faulty intelligence, much of which is happening through cellphone—unreliable cellphone data, you know, a lot of these attacks are carried out, and why we have the figures that we have of the numbers of people killed.